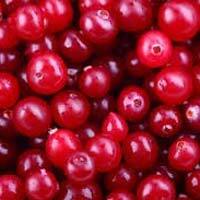 We are an affluent Exporter of Fresh Cranberry in Tamil Nadu, India. Our Cranberry has procured from reliable vendors who uses advanced agricultural techniques to grow it. The Cranberry, we offer, is known for its fruity taste and antioxidant properties. It is widely used to make juices, jams, cakes and many more. We pack Fresh Cranberry in food-grade packaging material in order to keep its freshness intact.